Hassle Free Septic is a family run business. At our core, we truly enjoy serving our customers. We do so with experience, courtesy, precision, and urgency. Your problem, is our business. Let us solve it for you. Contact Us Now , we’d love to hear from you. From the start of the job to the time we leave your site you will feel confident that your problem or situation will be resolved professionally and courteously. If you are a new customer, you’ll receive a follow up call ensuring that we provided you with the best service possible. We are serious about the environment. With a special waste hauling permit from the state of Minnesota you will feel at ease that your waste is being disposed of at approved facilities. With today’s strict local ordinances and state regulations on waste disposal we make sure that you are in compliance. An average septic tank needs to be pumped every two or three years. Please don’t wait until you have a $10,000 to $25,000 problem! Plan to get it pumped today! 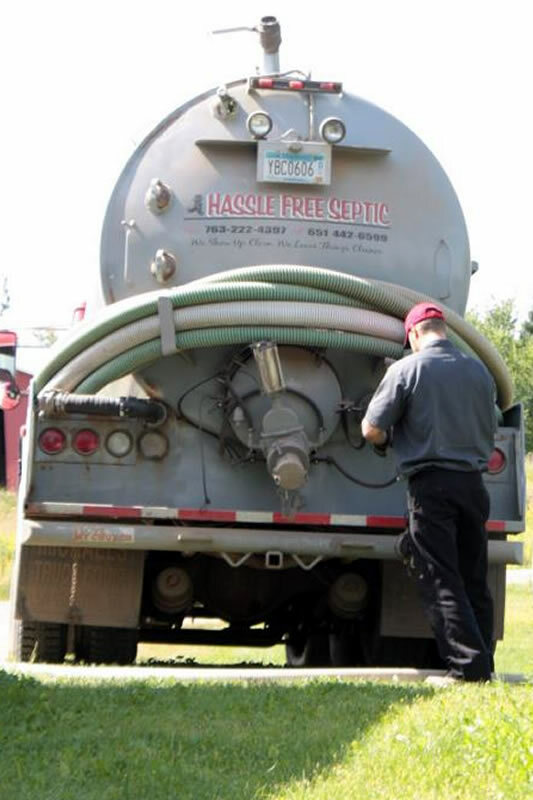 Call Hassle Free Septic for a free estimate or to schedule an appointment today!